I had some fun with some longer entries in this grid. Aside from the seed entry at B1 (mostly inspired by its corresponding clue), the stack of E1 and F2 was cool to fit in, and they're both entries that I don't believe I've seen in puzzles before. B2 might be an unknown for those who haven't seen the commercials on NBC lately, and especially might look bad a year from now if, for instance, the show is canceled after a season. But I thought it'd be fair enough with the clue, and I made sure the crossing blooms weren't too challenging. How'd this one treat you? In this meta, we were looking for a "1970s song." The instructions stated that four blooms had something wrong, and another hint at getting the song was contained in one of the rows. The four troublesome blooms needed only one letter in them, to be shared by the parallel rows. So for instance, D1's answer was BUMMER(D)UDE and LA STRA(D)A, both sharing the D in parentheses. Those blooms, read from top to bottom and left to right, spell out DEAD. And if you take B1 and the S of B2, you see the ROLLINGSTONES hanging out in Row B. Seeing that this is a garden after all (with AMARYLLIS confirming that in Row A), what could possibly be the answer? Fittingly, it's DEAD FLOWERS, a country-inspired song off the Rolling Stones' seminal 1971 album Sticky Fingers. It's been oft-covered since then, with probably my favorite version being Townes Van Zandt's, which was featured at the end of The Big Lebowski. I think you have broken new ground with this one. Say it ain't so - can't we get just a couple more frost-free weeks here in Minnesota before the growing season is going, going, gone? I play keyboards in a band, and this is one of the cover songs that's in our rotation. I won't forget to put roses on your grave. Those are the closing lyrics to "Dead Flowers." A fair amount of solvers mentioned they weren't familiar with the song, but were able to come across the correct answer. 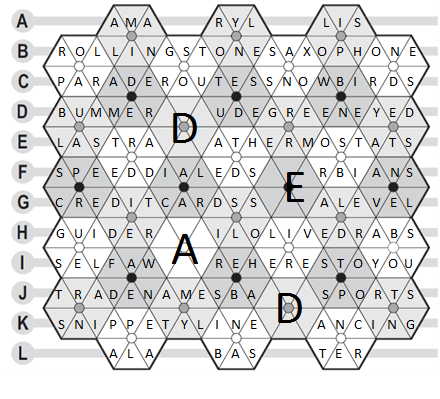 While it's no doubt disappointing when solving a meta puzzle that you need external resources to come up with the answer (it's much more satisfying if you reach the "a-ha" yourself), I was pleased that "Dead Flowers" had enough of a "click" factor once googling "Rolling Stones dead". No doubt the floral aspect of the answer was enough for these solvers to be confident in their answer. So I do feel bad that "Dead Flowers" is a bit too much of a deep cut (especially when considering the Stones' vast oeuvre) for universal recognition, but as I mentioned I was satisfied that the meta was solvable even for those who aren't familiar with the song. 87 solvers submitted the correct answers, along with 9 incorrect answers. Using a random number generator, the winners of a 2015 subscription and a copy of my upcoming Creepy Crosswords are: Daniel Streit and Matthew Mitchell. Congratulations to both, and thanks again for everyone for playing! Meta Rows Garden - And it's a contest! I’m excited to release this BONUS Rows Garden, and even more, it’s a meta contest! Instructions for solving the meta are included underneath the title of the Rows Garden. You may find the need to consult external materials to arrive at the meta answer; this is more than okay and indeed encouraged. Once you’ve found the answer, email me at aries.puzzles@gmail.com before next Wednesday, September 17th at 11:00 AM CDT with your answer in the subject line of the email. You only can send one answer, so make sure it’s right before submitting. Two solvers who send in correct answers, chosen at random, will each receive a 2015 Aries Puzzles Rows Garden subscription, as well as an autographed copy of my upcoming book of standard crosswords, Creepy Crosswords. Feel free to share this link with family, friends, or any other interested puzzle people. Brief write-up today...check back on the site on Friday for a fun announcement - or, if you're a subscriber, check your in-box tomorrow for a nice surprise.